Imperfectly Painted: What's that smell......? I have to say the flea markets in Florida are interesting places. They sell a wide-variety of things many of which you have no use for or look to be something that was popular around 1985. My trip the flea market yesterday was unsuccessful. There is one vendor there who sells China Glaze, but for $5 a bottle. I can get China Glaze for $3 a bottle on e-tailers, so it doesn't seem worth it to me. Plus, the booth is so small the lady who owns it gets in your personal space and hounds you about it until you cave in a buy something. It's a rather uncomfortable situation. Anyways a few months ago I did find a pretty polish in one of the "dollar stores" at the flea market filled with foreign items. This polish was only a dollar and it was in a box full of other no-name polishes. Many of the ones in there were pretty ugly colors or dried up, but there were a few pretty ones. The reason I post this is because Body and Soul posted about the same brand of no-name polish the other day. This is a red foil-like shimmer. It is truly a beautiful and unique red. That's not always easy to say. It actually reminds a lot of some the reds coming out in upcoming fall collections. However, there is a problem with this. Let me first say I've never been overly concerned with what is in my nail polish. It is probably because all my polishes are brands I'm familiar with are well known. I'm not someone who only will use "Big 3 Free" or vegan polishes etc. This polish....well it concerns me. We have some pigs engaged in some strange antics with a baby piglet watching......I have NO IDEA. Don't ask. 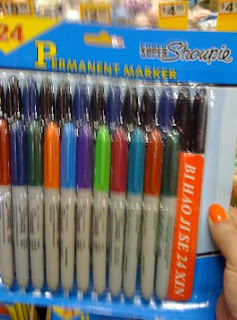 We have some Shoupies not to be confused with "Sharpies"! Again. I have no idea. I don't even want to know either. That's the flea market for you! Do you have any brands or types of nail polishes you won't use because of the ingredients or smell? Please tell which flea market you found these polishes. I must be prone to the smell of polish. Seems I don't smell them anymore. Is that bad or what. lol! 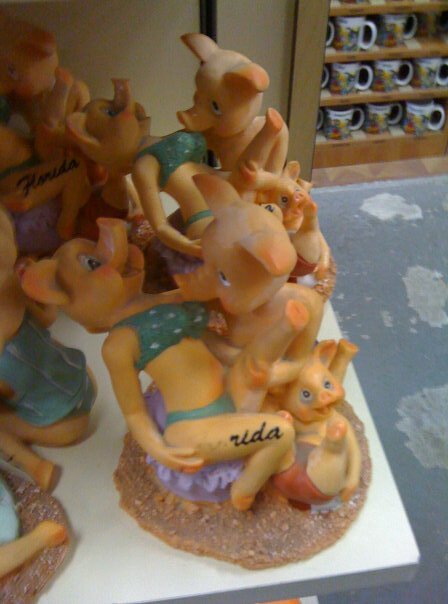 Explicit pig-antics. X-rated. Very nice, very tasteful. The flea market we have here usually just sells bulk toiletries and chickens, occasionally puppies. Also tomatoes. And bongs. It's pretty skeevy. I really do try to stay away from polishes that aren't B3F. I usually just avoid polishes based on formula, though, ha. I did finally get rid of this one really old Orly of mine, though, because it smelled so bad whenever I opened it, and the formula was pretty horrible, too. OH MY Those are some dirty pigs - goodness! Fortunately all the poishes in my stash as of yet are brand name. Too bad it's so stinky because the colorad is great! 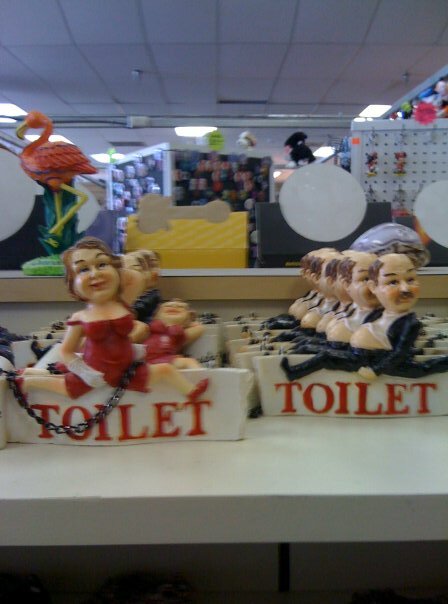 I love the toilet signs! They're literally "holding on" till they can get to the bathroom! rmcandlelight- It's the International Drive Flea Market on International over near Festival Bya Mall. Lacquerware- You mean you don't like those awesome pigs? I'm jk. I have feeling I do use big 3 free polishes i just don't realize it. Jean- This flea market also had it's share of bongs but for "tobacco use only". Yeah right. Yeah the smell will really deter me from using a nail polish. I have feeling I use mainly B3F. Freshie- You mean you wouldn't like those pigs displayed around your house? It would add such a touch of elegance! I'm just kidding! I know it does stink literally. I really like that color. Steffie- Yeah, it's really a shame if the color is pretty. The chemical smell is unbearable! I 'think' I saw that color and style of polish at the Sanford Flea Market. I'm soooo glad I didn't get it now. Even though it's pretty, the stink would trump it. Oh, those pigs would make the perfect gift at a 'Dirty Santa' game!!! Or, maybe I'll just get it and send it to my sister just for kicks. There are things at the flea market that do make me scratch my head. 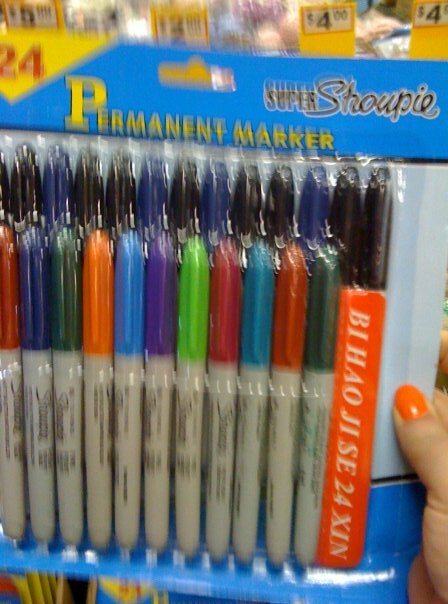 Oh, and the Shoupies...I bet they reeked too! I've never seen polish at a flea market before but that was before I was into polish. Seems like a great way to find old polishes. Sorry yours was smelly. Oh my God! I bought a np yesterday for $1 at this stall that was set up near my local supermarket, and as soon as I opened it to use it, this strong, disgusting wallpaint smell was released! I could barely get over the paint smell to paint 2 fingernails, it was so awful! :( It was also a random, no name brand that I will definitely not be going back for! So I completely understand. And yep, I'm pretty these smells come from the fact that its not big3 free. At least, that was my first thought. Stephanie, I just love your blogs! I will do my best to avoid polishes or products that test on animals. So... I tend to avoid a lot of drugstore brands unless they were given to me as a gift. I feel really bad if I don't use something that was given to me with the best of intentions. Uhm... yeah. That polish is beautiful but I'd be concerned about the content. I probably wouldn't use it anymore personally. What a shame!